The story of one of America”s most notorious killers is revealed in this true-crime comic unlike any other! Throughout the 1980s, the highest priority of Seattle-area police was the apprehension of the Green River Killer, the man responsible for the murders of dozens of women. But in 1990, with the body count numbering at least forty-eight, the case was put in the hands of a single detective, Tom Jensen. After twenty years, when the killer was finally captured with the help of DNA technology, Jensen and fellow detectives spent 188 days interviewing Gary Leon Ridgway in an effort to learn his most closely held secrets-an epic confrontation with evil that proved as disturbing and surreal as can be imagined. 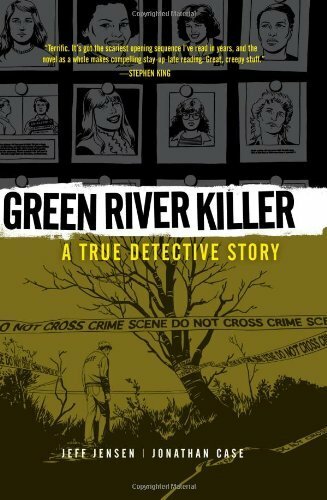 Written by Jensen”s own son, acclaimed entertainment journalist Jeff Jensen, Green River Killer: A True Detective Story presents the ultimate insider”s account of America”s most prolific serial killer. Certainly with drawings covering the murder investigation, this is one that will stay in a portion of your thought process for some time. It’s has black and white drawings basic artwork and not one for excellence in artwork but a dark true story of the search for truth for one cop that takes up most of his career time. His persistence pays off and truth prevails.